I’m excited to be able to share Spirits Melted Into Air with you: a two-week exploration I produced with the Royal Shakespeare Company, as part of their myShakespeare project. The work is in parts a technology prototype, data visualisation, and artwork. 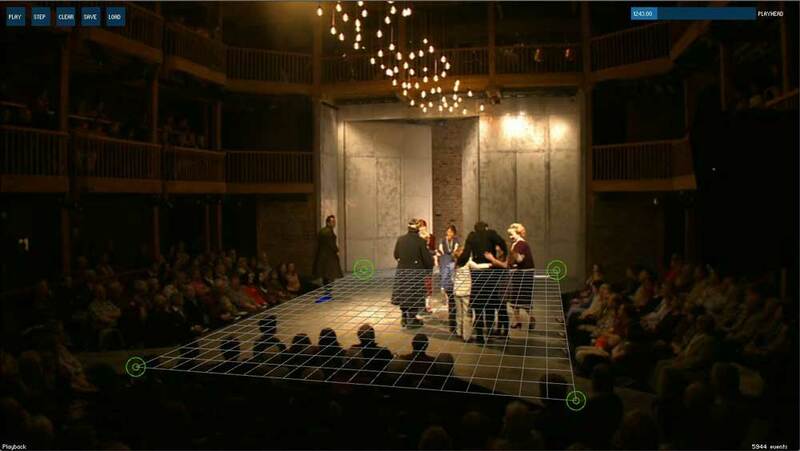 Custom-built, open-source software is used to analyse performance video and generate plots of actors’ positions on stage from a perspective viewpoint. 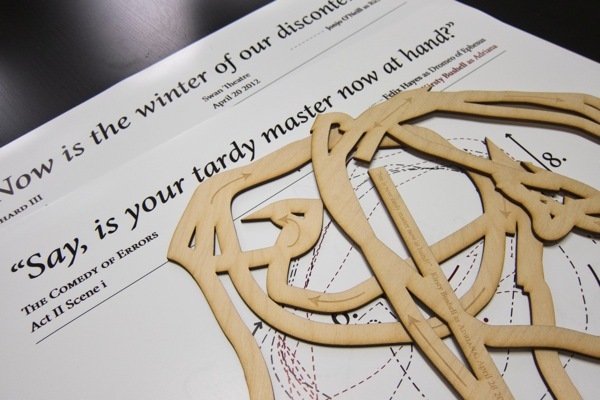 These plots are then used to generate new, secondary artworks: posters, and laser-cut wooden shapes. The project emerged from an initial workshop and commission by Caper, where we explored various potential ways for technologists to collaborate with the RSC on short projects. From there, I dealt with the RSC direct, meeting key members of their team and understanding a bit more about the various factors influencing performances and productions there. It was great to be able to take such a fluid, interpretative approach to the work. With hindsight, this was unsurprising: the RSC’s business is interpretation – taking Shakespeare and producing entirely new productions each year, of plays they have often performed countless times. My work was similarly interpretative: initially, building software to explore the data, and then exploring that data as a material – before moving onto the further material exploration of output formats. It’s the sort of structure to work that I’m fond of. It was also great to have a brief to shape, and ultimately push myself: not just exploring a single technical idea, but seeing it through, end-to-end, to output and display. It was important to me that whatever came out of it – however prototype-y – was both beautiful and accessible. I think the output – especially the lasercuts – has stood up to that internal demand. Thanks to Rachel and Kat at Caper for setting up the initial commission and the workshops; to Sarah and Ida, for producing the work from the RSC so superbly; and to everyone I met at the RSC who offered insight, ideas, and knowledge. You can find out more at the Spirits Melted Into Air website. And, if you’d like to know more about it, or indeed, to work with me on similar work – be it investigative, creative, or artistic – do get in touch. via @aanand, and because I forgot to bookmark this when I read it the first time. Good, straightforward points. "I wanted to compile a list of online, Web-based tools that Web engineers can use for their work in development, testing, debugging and documentation." It is a really good list (I say this mainly because the first thing on the list is RequestBin, which is the thing I always forget the name of). "A little paper tiger stood on the table, the size of two fists placed together. The skin of the tiger was the pattern on the wrapping paper, white background with red candy canes and green Christmas trees. I reached out to Mom's creation. Its tail twitched, and it pounced playfully at my finger. "Rawrr-sa," it growled, the sound somewhere between a cat and rustling newspapers." Ken Liu's "The Paper Menagerie" is just a lovely short story. Sad, deft, minimal, very much worth your time. Might have had a little sniffle. Hurrah: Natalia's project – detecting motion/noise in various corners of the RSC and telling a story about the institution, as a result – is now live. Really lovely piece of work.